Detour Rd. wrote: Hey HPM it think is one you are talking about. Its the 350 as we never had the 250 over here. You know how it is by us. Cubes. Thank you for that advice and everyone else, I'll see how it all goes with that. No the CL250 we had was completely different, with a single cylinder engine , twin port engine, which you guys over the pond there only had in the XL250S. 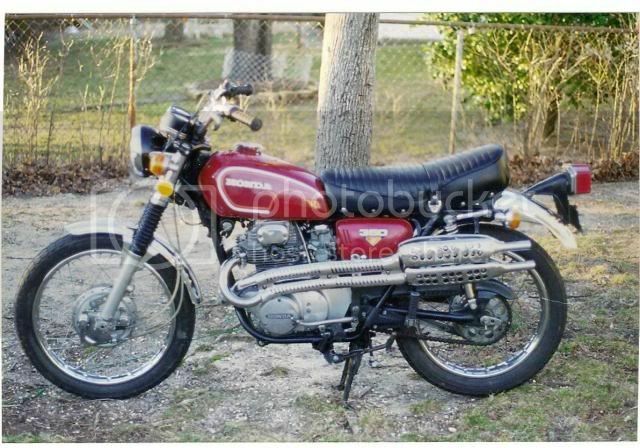 I don' think Honda every did a CL250 with the old K series engine not even for the Japanese market, although one day someone may prove me wrong. There was one on e-bay over here a few weeks ago, where someone had CL'd a CB250K, looked okay as well. Anyway, bike came yesterday, not quite as good as i hoped but when you're going by photo's and description many miles away you take your chances, and I did. Not much that I don't think I can refurb myself, the worst bit is the r/h side panel which is missing all the back end. I think I've tracked one down already, although a different colour. I'll hear more about that later maybe. Anyway. I will start a proper in the shed thread when I have photo's and have sorted out how I'm going to try to show them, even if all this is going to have be rather more in the back yard than in the shed. Sounds like it'll keep you busy HPM. Oh yes, but with father in law dead no more travelling and siting with him for hours while he sleeps, father is also now in a home close to where we live, so visiting will be more often but less travelling. I also have time anyway, as long as it stays dry, even when i get back to work it'll not be for five days a week, I'll have at least two days off plus weekends for a while anyway, hopefully will give me time if I can find the parts I do need, and nothing goes wrong, I hope to have it finished by the end of the summer. If not as far as it's gone will have to wait until the spring again, or until we find somewhere I can have a shed again. Pictures in my new thread, in the shed or rather in the back yard.